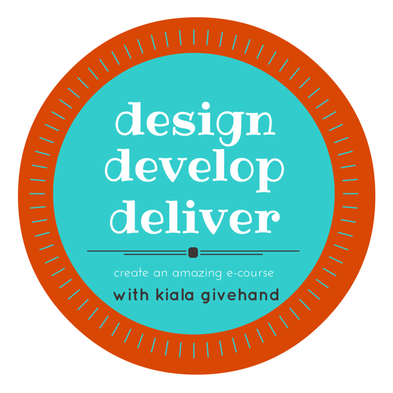 QUESTION: What is the Design • Develop • Deliver program? ANSWER: 3D is an intensive 6-module program that guides you through the process of creating your first (or 50th) online course. Whether you are creating a free mini course or a full blown year long coaching program, this self-paced course can help you design it, develop it, and deliver it with ease. QUESTION: How long do we have access to the program materials and information? ANSWER: Access will remain open indefinitely. You get to keep the PDFs and recorded coaching calls. QUESTION: I don't have a blog or website yet, can I still benefit from this class? ANSWER: Yes, but I recommend asking me about my one-on-one coaching packages so that you can get more individualized instruction on how to set up your online presence. This will help ensure that by the time you are ready, you have all the necessary elements in place to run an effective e-course. In a lot of ways my program will likely help you identify what tools will work best for your style of teaching and for your situation -- possibly saving you tons of headache down the road. This program is NOT dependent on social media, but you do need to have access to the internet and be willing to join the online discussion area where we will communicate during the course. It is important to note that running an e-course is dependent on building a strong online presence. You must be willing to do that and understand that it takes time to build. QUESTION: Do I need to know what my e-course will be before starting this program? ANSWER: No. The beauty of this program is that you can come with several ideas and begin to narrow them down using the interactive guides I provide each week. While I welcome and honor the multiple ideas most creatives have, I will encourage you to focus in on one idea throughout the program so that you can see how to put the steps in motion without me once the class has ended. QUESTION: When do the monthly coaching calls take place? ANSWER: All monthly coaching calls take place on the last Monday of each month at 5PM Eastern. Details are provided for you in the course. QUESTION: I can't make any of the monthly calls. Should I still sign up? ANSWER: Yes. All of the group coaching sessions will be recorded. You'll have access to me in the Google+ Community where you can ask me questions and get assistance from the group. The course content is not dependent on your attendance in the live sessions. ANSWER: At this time I do not offer the program elements in an à la carte fashion. QUESTION: Will there be a virtual Master Mind session? ANSWER: No. I will NOT be offering a Master Mind session. QUESTION: How much time does it take to run and manage an e-course? ANSWER: This varies from course to course and instructor to instructor and is determined by how you want to show up for your participants. I do share, in the program, ways to factor in time spent on these tasks when we talk about avoiding burnout. I also show ways to automate a lot of the process. QUESTION: What if I start the program and I can't complete it? Can I cancel and get a refund? ANSWER: All e-courses are non-refundable due to the immediate access you are given to the course materials. Please review the course information page carefully and email me with any questions or doubts before purchasing. I cannot issue refunds once the course has be purchased. QUESTION: Can I add one-on-one sessions with you during and/or after the program ends? ANSWER: Yes! These extra sessions are designed to give you additional support and accountability. I know the power of the one-on-one session and I would love to offer you additional guidance and encouragement. Connect with me via email once the class begins. QUESTION: What materials, supplies, and technology do I need in order to be successful in the program? A reliable computer, Internet connection, and the most updated software that will allow you to participate in online webinars, watch online videos, listen to MP3 files, and view PDFs. Be willing to sign up for the necessary forum so that you can fully participate in the private online space for the program. This is where you can interact with me and your fellow e-course leaders. A webcam (and headset) to fully participate in the live teaching sessions. A positive attitude of success and empowerment (even when you feel overwhelmed and frustrated with the technology). A desire to learn, to try new things, and to give in to the process. The ability to show up for your fellow participants by interacting thoughtfully and from a place of love, support, and encouragement. A grand sense of humor. A love for what you do and what you can share with the world. QUESTION: Kiala I'm really ready to join but I just need to experience you one-on-one, is there a way to talk with you before I decide?